The State of INDYCAR Event announcement confirmed that there will be two races in Canada for 2011. Track promoter Octane Motorsport Events, local businesses and the INDYCAR series have all come together to bring back the event which almost ceased following a dispute on land usage at the Edmonton City Center Airport. Agreeing to run on a different, newly-renovated part of the track. Awaking the great prarie City Center Airport of Edmonton with a sound other than turboprop and jet aircraft, the sound of internal combustion engines echo as auto racing events brought hundreds of thousands of visitors to the grounds. Holding CASCAR races through the 1990s, major league open wheel racing was first staged on the temporary street course in 2005. Original staged with Champ Car, INDYCAR took over the race in 2008 perserving it as the only Canadian race date of the season. Two years later, the future of the Edmonton Indy race was put into question as Octane Motorsport Events (the group behind the current Formula 1's Canadian Grand Prix) became the new promoter for the event. 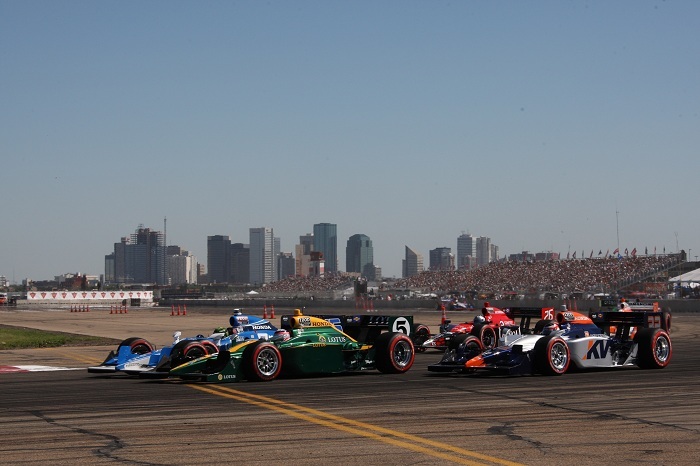 Grandstand changes and a debt carried from previous event arose as sticking points of many Edmonton Indy naysayers heading into the 2010 event. Despite this, the 2010 Edmonton Indy event resulted in a great on-track spectacle as a late-race blocking manuveur performed by Helio Castroneves resulted in a heated scene immediately following the event. Receiving a July 24th date on the 2011 IZOD INDYCAR Series schedule, track configuration is unknown at this time. It is also uncertain if the Firestone Indy Lights or the long-time mainstay NASCAR Canadian Tire Series will accompany the IZOD INDYCAR Series.